I think I may have found a new love for cherries. But only specifically, bing cherries. Never was a fan of the other commonly found cherry here in M’sia, Maraschino cherry cause of the colour and the medicine-taste-a-like. ew. But any cherry ‘flavoured’ thing is also a BIG no no for me. I just don’t know why, cherries taste and smell nice, but why can’t they make cherry flavour, at least close to being nice ?? Oh well.. If you’ve been wondering how come there’s so many (ok lar not THAT many but there’s another one coming up soon) cherry desserts, it’s because they’re in season and I bought it for a dirt cheap price from the night market. and I bought ALOT!! 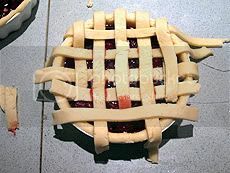 Evenly space strips of dough vertically across pie, letting ends hang over. Name them number 1,2,3,4,5 (from left or right) The starting with the even numbers (2, and 4) lift up and fold back every other strip halfway. 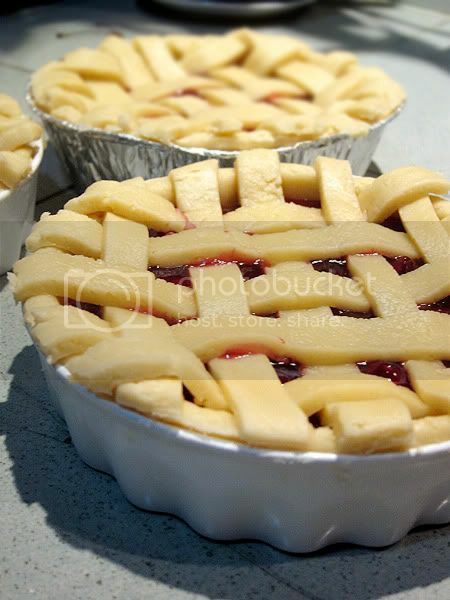 Place a strip of dough horizontally across the center of the pie. Return folded strips to their original position so they cross over the horizontal strip. Now for the 2nd horizontal layer, lift up the odd numbered strips (1,3 and 5) and evenly place the 2nd horizontal strip above the 1st. Return folded strips to their original position. 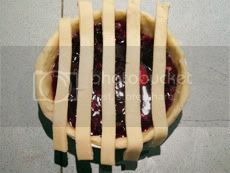 Repeat this pattern until you have covered the top half of the pie, then turn the pie around and repeat with the other half. It’s really not that confusing, but it takes a little bit of time if you’re doing a big pie. This pie was about 5″ diameter. Pie dish was from Ikea, or use disposable aluminum ones. the sauce is suppose to be all gooey and melting but because this was just lightly warmed in the oven, it didn’t quite had the effect..
Cut butter into cubes. In a food processor, blend butter, flour, salt and brown sugar together until it resembles coarse crumbs. Add in 1 tbsp of water at a time and whizz till it starts to come together to a rough ball. Remove and lightly knead it on a lightly floured surface so it forms a nice round ball. Wrap and keep in the fridge for 30 minutes – 1 hour to rest. 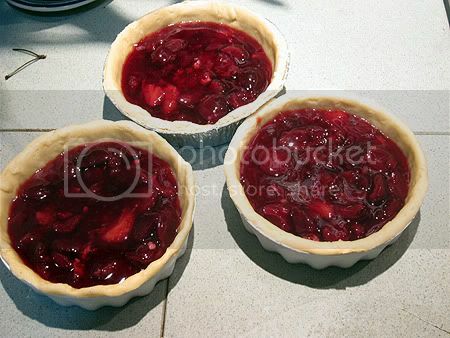 In a saucepan, place cherries (and strawberries if using), sugar and scrapped vanilla pod. Cook for 10 minutes. Dissolve corn starch with a bit of water, then add into saucepan. Stir for another 5 minutes or until sauce has thickened. Set aside to cool.Remove vanilla pod before pouring into pie dish. Remove the dough from the fridge and place it onto a well-floured surface. Cut it in about ‘2/3 : 1/3? ratio. With the 2/3, divide into 3, roll out to a 7″ diameter. Wrap around your rolling pin and carefully unroll over a 5-inch pie dish. If using a big pie dish, roll the entire 2/3 dough instead. 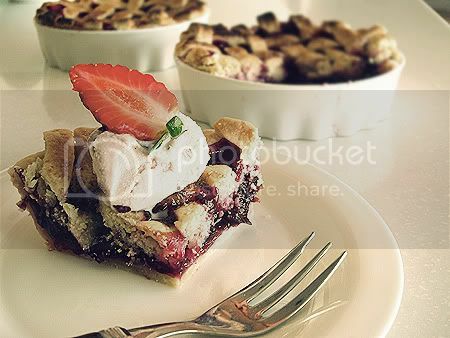 Repeat with the other pie dish. Fit gently into the bottom and the side of the dish. Use the back of the kitchen knife to trim the dough off. Use a fork and prick some holes at the bottom. For the remaining 1/3 dough, roll it out on a lightly floured surface. Cut long strips and weave according to the instructions above. 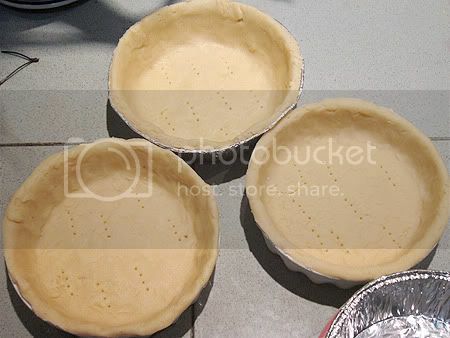 The width of the strip depends on how big the pie dish is. Mine was 1/2″, so it leaves a 1/2″ gap in between and it looks even. (Don’t do 1″ strip and leave a very small gap in between.) So keep a 1/2″ or 3/4″ width strip for a better looking lattice pattern! You can brush egg wash on top and sprinkle some brown sugar on top for the extra crunch. In my case, I brush with milk. Bake at 175 C for 30-45 minutes or until golden brown. 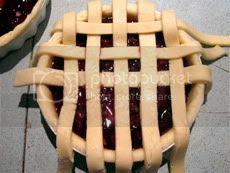 Time may vary in size of pie dish. 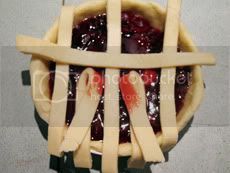 Now for the verdict, if I may say, I shall label cherry pie as my favourite pie. I don’t know how it will turn out with canned cherries, but the sweetness from the cherry is so yum! Adding some strawberries does give it a kick although by the time the strawberries have turned into mushy sauce. Oh the pie crust was fantastic! It’s buttery and flaky for a short crust, and not too crumbly either. I mean, well, look at the amount of butter. Haha. 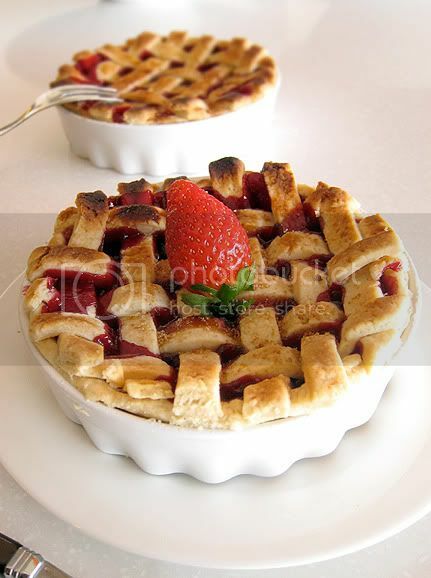 But I think I may use this pie crust recipe for any other pies that I’ll make. I’m going to make this again when there are cherries in the market! I’d say, the next available season is end of the year, the cherries would be from Australia! ? Oh to make it more sinful, add a scoop of fresh cherry ice cream on top! 😀 Or, try Ben and Jerry’s Cherry Garcia ice cream! 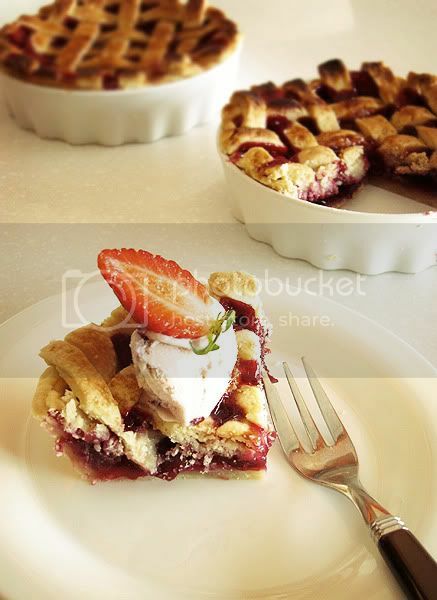 Very nicely done…too much work to try though:P Great photos! Yoooh! You ppl make me feel ashamed of myself la! …and your blood-red sorbet! Wow! Makes me wanna take away that strawberry jelly post of mine!!! I think it helped that you cooked the cherries in sugar first. 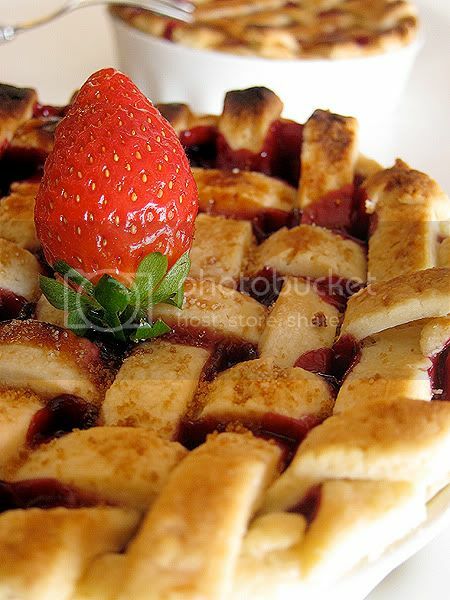 As beautiful as your pies look, I am not giving cherries another chance. 😉 They don’t stand a chance against Durians, which are in season now!! Wendy, less cornflour more juice! Ju: that’s too bad.. but oh well, can’t wait to see what u make with the durians!